Many Real Estate Agents, especially new ones, think of the industry as a Sales Endeavor; and that would be a limited way of truly seeing the big picture. 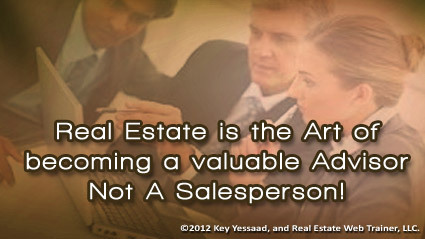 Real Estate is driven by Service, better yet by a kind of Coaching/Advisory relationship between consumers and agents. The entities doing the Selling and Buying are the Home Sellers and the Home Buyers; and of course the one doing the coaching and advising is the Real Estate Professional. How would you then increase your value as a Real Estate Advisor/Coach? This is an important question; your value and your long term success depend on it. Let me share with you what makes for great advisers/coaches: The ability to understand what people want and why they want it, then assisting them get what they want. This understanding must be grounded in local knowledge, statistics, and local changes to the Real Estate Market. As you put your business plan together for 2013 add the above question to the mix and your long term goals will become clear!